I recently had the very welcome opportunity to visit Virgin Atlantic's Clubhouse at JFK. I'd expected upscale hotel-ish food and drinks, but they did far better than that. The drinks menu featured a decent selection of wines, and I started my visit with a glass of Mumm NV Champagne. But when it was dinnertime, I decided to switch to a cocktail to accompany my (very good) steak with chevre mashed potatoes and haricots verts. 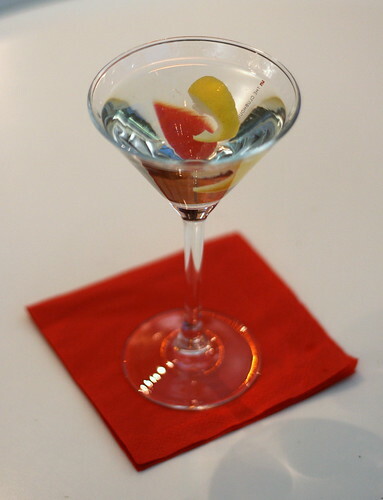 In last year's Quantum of Solace, Bond and the Vesper both return, although the drink's name isn't spoken; Bond gives the recipe to a bartender on board a Virgin Atlantic flight. And, the Vesper leads the cocktail list at Virgin's Clubhouse lounge, and went down quite nicely with my steak. They serve them in appropriately smallish cocktail glasses, and it was a very well-made, balanced drink. (Virgin makes theirs with six parts Bombay Sapphire, two parts Grey Goose, and one part Lillet Blanc, stirred and served with a twist.) Yes, I was a little surprised to see it stirred, but I think Virgin was going for clarity over accuracy with that decision. Shake hard, but set down gently. Serve up, garnished with an inflatable life vest. That's the best mixed drink name I've heard of in a long time. I REMEMBER THAT SCENE IN CASINO ROYALE!! vesper. that sounds like the name of a slutty bond girl. love it.